Unthinkable not long ago to vacation in Nicaragua, but now, fully bathed in peace, and blessed with preternatural beauty, it is a beginning blip on the adventure travelers' radar; perhaps at the brink of a tourism revolution. 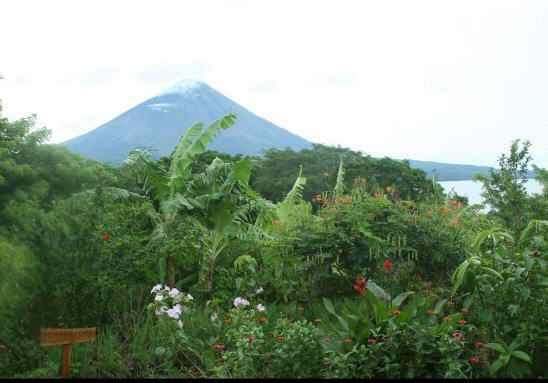 So, with family and friends (the well-traveled Baird and Kaye families), I make the tramp to Lago de Nicaragua, a lake too vast to see across, second largest in all the tropics, where 25 years ago guerrillas skulked among the broad-leafed trees of the 365 volcanic islands. Now the islands are garlanded with eco-lodges offering pieces of paradise to snowbirds, and we decide to check out two. Out of the midst of the beautiful Lake Nicaragua spring two magnificent pyramids, clad in the softest and richest green, all flecked with shadow and sunshine, whose summits pierce the billowy clouds. 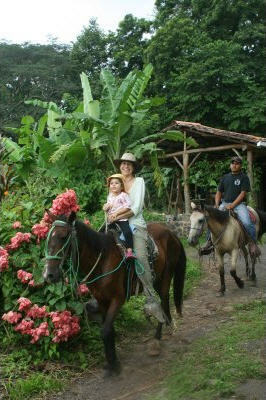 The pyramids are the Madeas and Concepcion Volcanoes, and on a high saddle squats the small, earnest ecolodge of Totoco. For the last miles of the trip, we trundle up a dirt road outstanding in the number and quality of its ruts, to a lodge that fits funkily in ecotown. In the most wholesome sense it pongs eco, with spartan bamboo cabanas and dormitories equipped with independent renewable energy supplies, grey water recycling systems, pit-toilets that guests compost, and service roped in rubber time. But what it might lack in amenities, the lodge makes up for in the volcanic views, blizzards of butterflies, and the weapons-grade margaritas. Then there are the green iguanas meditating inches beyond the balcony, looking like watercolors, or Tantric art. In the pre-dawn there are the calls of howler monkeys, who sound like a composite of all the voices ever heard. But the greatest assets are the activities, such as peak climbing, hiking to petroglyphs, biking, kayaking, and most rewarding for our families, with kids ranging from 3 to 15, horseback riding from the town of Balgüe up the fecund volcanic flanks, past fields and forests practically vibrating with various shades of green, to the haunt on the hill. Next, though, we sail over to the private island of Jicaro, off the shores of the old colonial capital of Granada. Here, at a small stone pier, we step into the alternative universe of the Jicaro Island Ecolodge, managed by Cayuga, the firm that oversees a chain of high-end but rigorously sustainable eco-lodges in Central America. At landing it is evident this is a lodge on the other side of epicurean, stylistically tropo, comfortable, pampering, artfully crafted. The difference between the two lodges is like the difference between a drum beat and a Bach fugue. Where Totoco is decorously austere, Jicaro is rather a boutique luxury retreat, complete with cool welcome drinks under sweeping palm fronds, fresh locally-grown coffee served on private decks, designer dinners, and a decadent Zen-like spa overlooking the still waters. Yet, it is guilt -free, with water heated by solar panels, the two-story casitas made from Rainforest Alliance certified wood (salvaged from Hurricane Felix, no less), and organic and biodegradable soaps, cleaning detergents and spa products throughout. Even the straws, bowls, placemats, and other utensils pulse with nature, made as they are from the local jicaro wood. It is a place so tranquil, so steeped in frangible scenes of beauty, it defies the popular cobwebs of conflict that seem not so long ago. 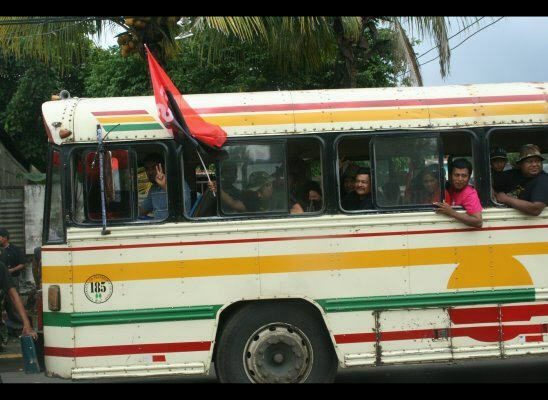 The Nicaragua that capers in most minds is from images from the late 70s, a country then bleeding in civil war. The conflict ended with the Sandinistas' 1979 overthrow of the Somoza family's four-decades-long regime. Then came the dozen years of postwar fighting as the American-backed contra rebels -- with the assist of a U.S. embargo -- pushed the Sandinista Front of National Liberation out of power. Though Daniel Ortega is back in command, quietly the country has returned to a state of grace. Visitor numbers have increased 170% since 1993, from 200,000 to 525,000 last year; tourism dollars increased some 400% in the same time frame, from $30 million to $150 million. And some think the tourism volcano is just beginning its trembles. Yet everything registers at rubber time here. If something is worth doing, it is worth doing slowly. So, after a morning lounging about, inhaling the floral perfumes, swimming in both the warm lake waters and the saltwater dipping pool, built around the island's natural rock, we decide to take a kayak trip to the hot springs at the foot of the nearby Mombacho Volcano. We rotor across the quiet lake as the mile-high volcano blends with the uncertain sky, recalling the important but fugitive parts of ourselves. We glide beneath a rainbow of feathers, from tropic cormorants to Amazon kingfishers to green herons. Along the shore are ceiba and banana and ficus, and bright emerald clusters of sea lettuce (Chlorophyta), water hyacinth, giant mango trees, the fruit tree called poponjoche, and the bright-blossomed national flower, the Sacuanjocheink. Outlying islands look like green animals in repose. The whole world seems alive here, top to bottom, and we seem very much a part of an interconnected ecosystem. Like Mesoamerican warriors we bevel through a wedge in the dense vegetation to a small lake within the lake, where the water temperature increases to near boiling, and here we strip and take quick dips in water we hope offers some sort of healing. There is something about warm water in the tropics...it invites us to join in a mood we find incapable of summoning elsewhere. Later we sail over to Granada, a city where franchise culture has yet to foothold. Not long ago the ghosts of the Chorotega Indians haunted this city, crossing telephone wires to kindle intrigue and evocations of clashes with the Spanish who settled here in 1524, one of the earliest foreign settlements on the continent. But self-pity is absent now. The mood is one of hope, lambent optimism for the future, and the streets are busy: wares, from hammocks to human hair brushes to hawksbill turtle shells, are being hawked with zest; horse-drawn buggies spindle in and about the cobblestone streets; children are skylarking in the alleys. In the silky afternoon air we clop along past Spanish-style pastel-hued houses, under palms and pepper trees, by clumps of old men with leathery skin stretched tight over high, sharp bones, alongside energetic murals, beneath baroque cathedrals with big cedar doors, and beside shops flogging crocodile boots and Cuban cigars. The entire city was gutted by William Walker, the American filibuster who declared himself president of Nicaragua in 1856, and was shot by firing squad four years later. The city has been given a face lift, freshly painted in mustard, peach and salmon, and now looks more like a colonial city than in its heyday. Yet so much of the city, and the nation, remain true to an earlier time and sensibility. During the California gold rush ships sailed south from New York to the mouth of Nicaragua's Rio San Juan. Gold miners then boated up the 100-mile-long river to Lago de Nicaragua, and then made a 15 mile overland trek to the Pacific Ocean, where another ship took them north to San Francisco. This was also the route that for many years was considered the preferential path for a trans-ocean canal, but politics (and caveats about the dangers of volcanoes) pushed it to Panama. That hinge of history may be a blessing today for Nicaragua, as it basks in an authenticity long lost in Panama and other isthmus nations. As we make the twilight crossing back to Jicaro, we pass a soccer-field sized island with a "For Sale" sign, one of many scattered throughout Lago Nicaragua. My wife insists we pull over. Beneath the palms it hosts a couple of structures in need of repair, but as a realtor might say, it is 'bursting with potential.' Our guide says it has been listed for quite some time, as most island seekers are still nervous about buying here. The price tag is just $80,000, and my son, Walker, says, "Let's buy it!" Nicaragua may be transforming from hot zone to hot destination, but history is just a rough draft. Betwixt its tousled past and its eco-lined future, the country is a magic glass through which the past elides, and the future flows thick with possibilities.